With Great Game Day Grub! Football season is about more than just the game. Whether you're on the couch with a few buddies or in the stands with a bunch of die-hard fans, every game requires traditional tailgating munchies. Buffalo Wings reign as one of the most popular game day eats with more than one billion wings consumed during Super Bowl weekend alone! The secret to creating your favorite restaurant-style wings at home is FRANK'S® REDHOT® Cayenne Pepper Sauce, the secret ingredient used in the original Buffalo Wing sauce and an all time favorite since its debut in 1964. Frank's RedHot also delivers fun and excitement to a variety of foods, way beyond wings. Ethel Herman, well known for her popular radio spots touting the benefits of RedHot, says, "I put that sauce on everything! At my game day gatherings there's a bottle on every table. I especially enjoy splashing my favorite elixir on everyday foods like pizza, fries, tacos, popcorn, shrimp and foot-long subs." So kick-off the season with Frank's new flavors - Sweet Heat BBQ & Hot Buffalo wing sauces - and also try these great recipes to score big with your friends and family. 1. GRILL wingsover medium heat 20 to 25 min. until cooked and crispy. 2. TOSS in Buffalo Wing Sauce. Tip: Thaw frozen wings before grilling. Wing Variations: Cook wings as directed above. Toss in one of the sauce variations below. Combine 1/4 cup soy sauce, 3 tablespoons Frank's RedHot Sauce, 3 tablespoons honey, 2 tablespoons peanut oil, 1 teaspoon grated peeled fresh ginger and 1 teaspoon minced garlic in small bowl. Mix until well blended. Combine 1/3 cup Frank's RedHot Sauce, 1/3 cup ketchup, 1/4 cup melted butter or margarine, and 2 teaspoons Cajun seasoning blend in small bowl. Mix until well blended. Combine 1/4 cup Frank's RedHot Sauce, 1/4 cup melted butter or margarine, 1/4 cup chili sauce, and 1 teaspoon chili powder in small bowl. Mix until well blended. 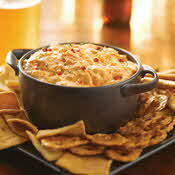 This robust creamy dip tastes like Buffalo Chicken Wings but without the mess and the red fingers! Serve hot with celery sticks or veggies. 1. HEAT oven to 350°F. Place cream cheese into deep baking dish. Stir until smooth. 2. MIX in salad dressing, Frank's RedHot Sauce and cheese. Stir in chicken. 3. BAKE 20 min. or until mixture is heated through; stir. Garnish as desired. Serve with crackers or vegetables. Prepare as above. Place in microwave-safe dish. Microwave, uncovered, on HIGH 5 min. until hot, stirring halfway through cooking. Tips: You may substitute 2 cups shredded cooked chicken. Combine ingredients as directed above. Place mixture into small slow cooker. Cover pot. Heat on HIGH setting for 1 1/2 hours until hot and bubbly or on LOW setting for 2 1/2 to 3 hours. Stir. Prepare dip ahead and place in heavy disposable foil pan. Place pan on grill and heat dip until hot and bubbly. A quick, easy snack to nibble on with summer cocktails. 1. 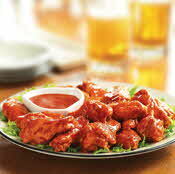 Toss chicken with Buffalo Wing Sauce. 2. Layer chicken mixture with chips and cheese in baking dish or on pizza pan. 3. Bake at 350°F for 5 min. until hot and cheese melts. Garnish as desired. Serve with blue cheese dressing, sour cream and additional Buffalo Wing Sauce. Tip: You may substitute 1/3 cup FRANK'S® REDHOT® Cayenne Pepper Sauce mixed with 3 Tbsp. melted butter. Variations: Add 1/2 cup of the following to nachos along with chicken: chopped bell peppers, sliced green onion, sliced black peppers or diced jalapeno peppers. For a change of pace, substitute 2 cups diced shrimp. French's Foods, a division of Reckitt Benckiser Inc., the maker of Frank's® Redhot® Cayenne Pepper Sauce,is a leading manufacturer, marketer, and distributor of food and household products. Some other well known, trusted household names in the Reckitt Benckiser Inc. family of food products include Cattlemen's® Barbecue Sauce, French's® mustards and French's® French Fried Onions. All contents are copyright © 1990 - 2019 James T. Ehler and www.FoodReference.com unless otherwise noted. All rights reserved. You may copy and use portions of this website for non-commercial, personal use only.